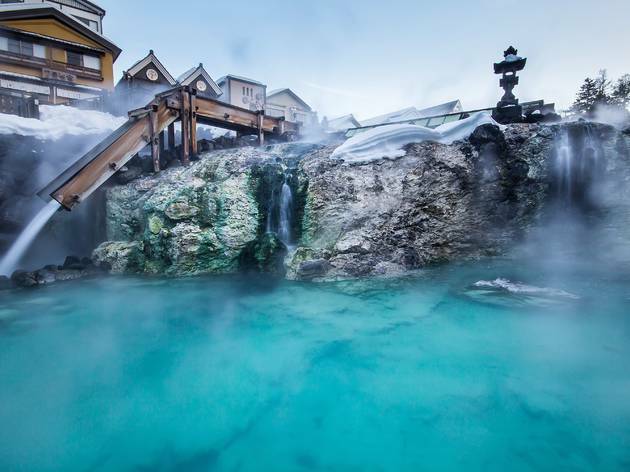 Hot springs, or onsen, are a big deal in Japan. Not to be confused with sento, which are simply public baths using heated tap water, onsen are comprised of volcanic spring water that's full of natural minerals, giving health benefits like clearer skin, detoxification and even weight loss (it's said that bathing in the hottest onsen water can burn the same amount of kilojoules as jogging). As winter descends, they also become desirable destinations for daytrips and weekend breaks, so we've rounded up six of the best. If you're a first-timer, be sure to check out our article on 'Onsen etiquette'. Its water is so hot that there’s a special stirring procedure to cool it, rather than adding cold water, which would dilute the potency of the minerals (said to be able to cure any sickness except lovesickness). This stirring method is called Yumomi and can be watched as a performance at certain times. The most popular public hot spring is Sai no Kawara Rotenburo, located in Sai no Kawara Park. 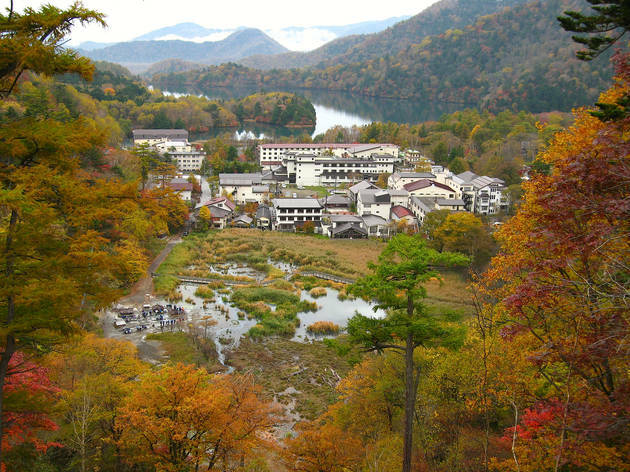 It boasts pretty forest views and pure, steaming water, and the entrance fee is just ¥500. Tip: buy some Yu no Hana hot spring powder to experience the healing minerals of Japan’s hot springs at home. If you’re looking for something else to do in the area, Mt Shirane offers pretty hiking trails in spring and summer, and in winter, skiers can take on the mountain slopes – Kusatsu Snow & Spa Resort (www.kusatsu-kokusai.com) is open from early December to mid-April. How to get there It’s about 2.5 hours from Ueno Station on the weekends-only Kusatsu limited-express train to Naganohara- Kusatsuguchi Station (otherwise take the shinkansen or Takasaki line to Takasaki Station, then change to the Agatsuma line), and then a 25-minute bus ride to Kusatsu Onsen bus terminal. 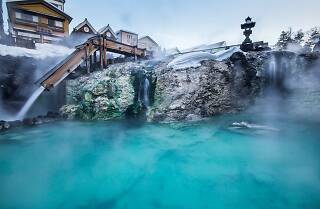 Known as the hot spring capital of Japan, Beppu is made up of a cluster of eight onsen areas. It's a bit of a trek to get there, but it's worth a visit for its variety of baths including mud, steam and even sand baths. Speaking of which, be sure to try the Beppu Beach Sand Bath (0977 66 5737, tinyurl.com/TOTbeppusand) on Shoningahama beach, where you’ll be submerged in volcanically heated sand while overlooking soft-crashing waves. Top tip: go on the 'Hell Tour', which takes you to eight of the hottest onsen in Beppu, nicknamed 'jigoku' (burning hell). Look out for the hot-water lovin' crocs at Oniyama Jigoku. By air 1 hour 40 minutes from Haneda Airport to Oita Airport, then a 45-minute bus ride to the bus stop Beppu Kitahama. By train Five hours by shinkansen from Tokyo Station. Take the Nozomi Shinkansen to Kokura Station, then transfer to the Sonic limited express to Beppu Station. Travel by Hikari and Sakura trains will require an extra hour and another transfer at Shin-Osaka Station. In the hot spring area of Ginzan Onsen, wooden buildings line the Ginzan river and at night the soothing rush of the water, lit up by flickering gas lamps, creates the atmosphere of a Japanese fairy tale. Winter, when crisp white snow frosts the whole town, is prime season at Ginzan Onsen. It’s the perfect place to experience outdoor winter bathing. Brisk air on your upper body and face makes for a delicious contrast to the warmth of the water. It’s an extremely popular winter bathing spot, so book early, as much as three months in advance. The highlight of the area is definitely the scenery. For sightseeing, you’ll have to look elsewhere in Yamagata like Zao Onsen area, which is decorated with snow sculptures in winter. How to get there It’s roughly 3.5 hours from Tokyo Station to Oishida Station by Yamagata Shinkansen, and then 40 minutes by bus to Ginzan Onsen bus stop. 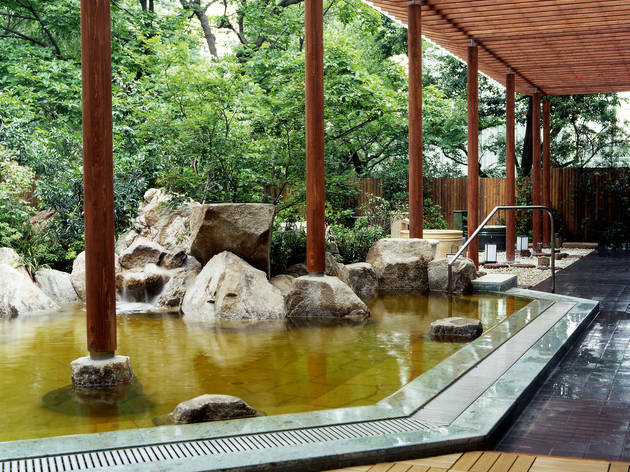 Another place where you can wear bathing suits in a designated area (good for couples who want to hang out together), Niwa no Yu is a spa/onsen in Tokyo. While the waters aren’t as mineral rich as true onsen, since they come from drilling underground, Niwa no Yu is an easy trip for Tokyoites and the facilities are impressive. The spa is housed in a Japanese garden making for relaxing outdoor views. Note that no children are allowed. At this hot spring area that’s part of Nikko National Park and just next to Lake Yunoko, steam rises up from vents in the ground, admittedly making the air and the water smell like stinky sulphur, but the water is packed with minerals that leave skin tingling. The entire area is dotted with ryokan featuring onsen and just north of the ‘town’ you’ll find Yunodaira Marsh, where hot water actually bubbles up from the ground. On your way to Yumoto Onsen, it’s worth stopping off at Ryuzu Waterfall and making the trek through the dreamlike Senjogahara hiking trail. How to get there It’s about two hours from Tobu Asakusa Station by rapid train to Tobu Nikko Station. Leave early, because Yumoto Onsen is an 80-minute bus ride from Tobu Nikko Station (ask for details at the tourist office inside the station). Buy the All Nikko Pass 2-Day Nikko Pass from Tobu Asakusa Station to get discounted travel. 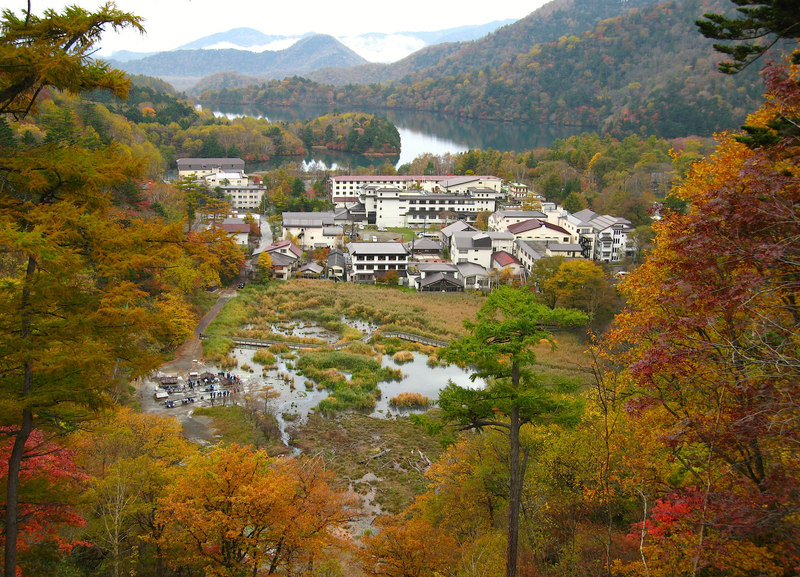 Contact 0288 62 2570 (Oku-Nikko Yumoto Hot Spring Hotels Cooperative). 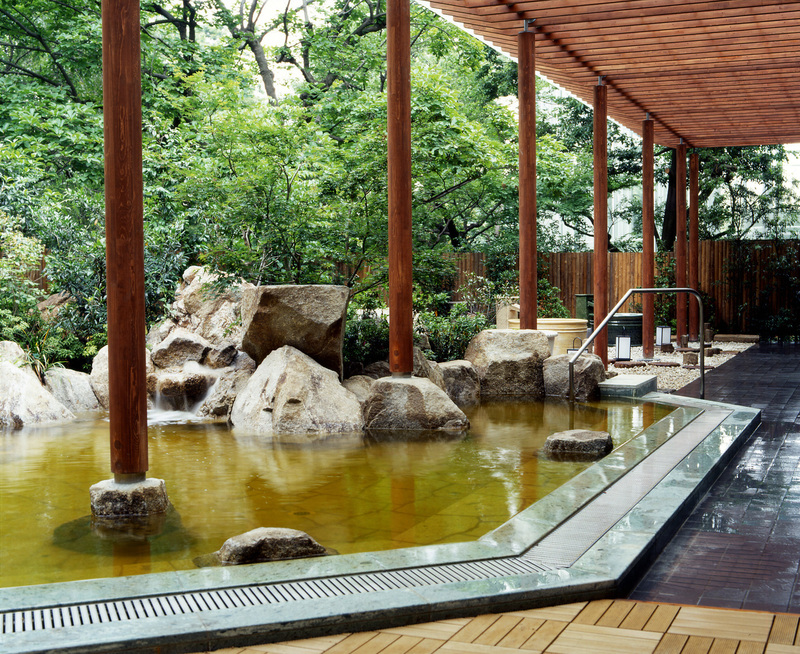 Many hotels and ryokan in Hakone open their baths to the public, but one of the most notable onsen is Hakone Yuryo. Surrounded by nature, it has indoor and outdoor communal baths, as well as 19 private open-air baths (for an extra fee) and massage services. How to get there It’s about 90 minutes from Shinjuku Station on the Odakyu Romance Car to Hakone-Yumoto Station. Buy the Hakone Freepass, which covers your round-trip fare and unlimited use of transportation such as trains, buses and even ropeways and boats in the area. Contact 4 Tonosawa, Hakone, Ashigara-shimo, Kanagawa. 0460 85 8411. www.hakoneyuryo.jp/english.